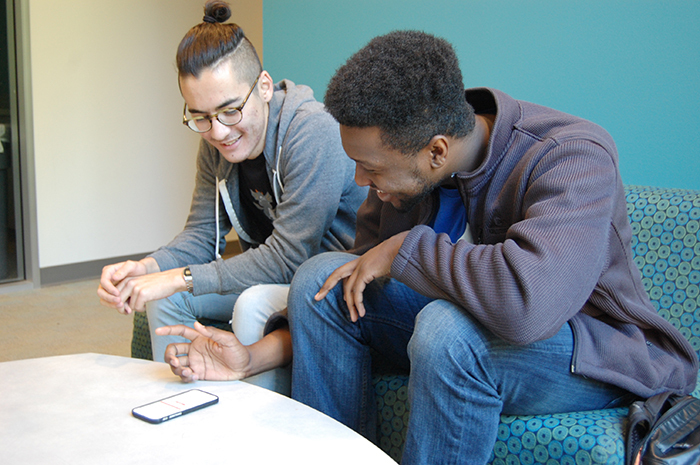 Vernon Coleman, a third-year Baskin School of Engineering student studying Technology & Information Management, and Kevin Robertson, also a third-year Baskin School of Engineering student, studying Computer Science, have collaborated over the past three years to create a successful app that will enhance the lives of their peers around them. This “map” that Vernon had the idea of creating would later become the app "Realtime." In the dialog below, taken from our interview with Vernon and Kevin, we discussed the ins and outs of their app, their expectations, their aspirations, how they are getting the word out about Realtime, and much more. Q: Tell us about your App. What does it do? A: When you open Realtime, you have Realtime events at the top that are happening today, and then we have an activity feed that includes a list of people you can add around campus based on your interests. Some of these people are my friends, and when they become friends, I can see the events and groups they’re a part of. Swiping over to the left, you can see the search section. If we go into “Parties at UCSC,” we can see it has 476 people in the group. I can see all of the people, I can go in, look at what their “convo start” is, add them as friends, and then we can talk. Same thing with events: popular events, upcoming events, it’s all very easy to discover what’s going on all around you. What makes us unique is the spontaneous aspect of our app. Let’s say I wanted to watch a movie. I can tap the “post” button, choose friends or groups, or I can post it to the homepage. When I hit, “post to the homepage,” it alerts people on campus who have similar interests as me to do the activity. 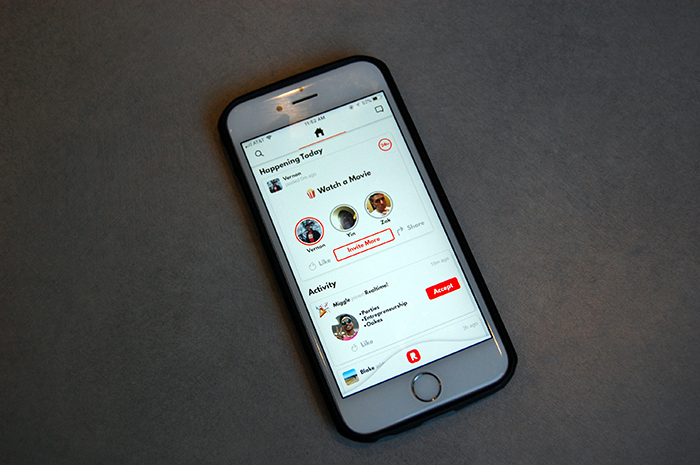 The whole point is to facilitate a connection through an experience, and create the events app for the Insta generation; that’s the basis of Realtime. Q: How many users do you have now? A: We’re at 1,200 users. We did that in about six school weeks. Most of the growth has been organic, and we’re about to start ramping up our growth strategy, to start to get critical mass on this campus. Q: How do you promote your App? A: Over the summer, Kevin and I went back to my house in South Carolina, in the mountains; we did a whole bunch of fundraising, and we tried social media advertising. It seemed promising, but you have to spend $8 per engagement on posts. That’s not very efficient when you’re not monetizing the product. What we plan on doing is a grass-roots, organic approach: having people present in front of classes. We have a class presentation that’s tailored and optimized to finding a study partner easily in math III, because that’s a class that a lot of people struggle in. And then a group presentation as well, presenting in front of groups, and getting those groups to use this as an outreach and communication platform. We are working with “influencers” who are being trained to go out and influence people to try the app; they’re our brand ambassadors. Q: How do you think being at UCSC has helped you develop this? A: I think one of the unique aspects is that since we are in a space that isn’t necessarily super-saturated with other entrepreneurs, especially in “Social Apps.” It helps us stand out. Q: What are some of the technical challenges? A: There’s a good amount. One of the difficult things we’ve constantly been trying to figure out is balancing the speed of development with the sustainability of it. If you’re writing code really fast, most of the time you’ll make a couple mistakes, and the faster you’re trying to move, the less you’ll be testing things. That can leave certain bugs that can cause problems later. When we started with Club Connect, we were both doing IOS development, but about six months into that, Vernon took more of the business end, and I took more of the technical end. Since then it’s mostly been just me working on the technical side. I’ll get a little bit of advice from Vernon, but since there are no other developers, sometimes it’s hard to stay grounded in what I’m doing. Q: Are there any faculty in particular who have really helped you with this project? A: John Skardon. He’s a lecturer in the Baskin School of Engineering. He teaches some of the TIM (Technology & Information Management) classes I’ve enjoyed: TIM20, TIM21; classes where you actually get to work on your start-up, to present it in front of the class. He’s been very helpful in terms of giving us advice on how we’re doing, and how we’re doing it. I strolled into his office freshman year (this was before Realtime) and he gave me advice on what we should do: we didn’t listen. The result of Club Connect not working out because of ignoring his advice was us moving on to create Realtime, and he’s been really, really helpful during the whole process. Also, Professor Haddad, a Professor of Environmental Studies, who works in the Technology & Information Management department, has been very helpful. He connected us to our company attorney and he’s given us some good advice as well. There are some other University employees that have assisted us, Rosa Plaza, the Director of Orientation, Pablo Reguerin, the Assistant Vice Provost of Student Success, he helped us to develop some of the things we were doing and how we could make it more accessible to students, as well as Manel Camps, Crown Provost, and a bunch of other folks that I haven’t mentioned that have been helpful in the process of getting things done. Q: What were your expectations for the app? Have they been met or exceeded? A: At the beginning of the summer I was feeling like it would be blowing up pretty quickly, and at this point we would have a couple thousand users, but even though it hasn’t met those expectations, it’s still been a very rewarding process to go through. To see the marketing team starting to come together, the product itself moving along; it hasn’t met the expectations in terms of numbers, but it’s exceeded the expectations in terms of how rewarding it has been, and how much fun it’s been to work.